I am George Baltzegar of Open Eyedeas and I may be of service to you. I am a graduate from Kennesaw State University with a BA in Graphic Design and 10 years of experience in the design and print industry. About 3 years ago I started Open Eyedeas and we are located in Buchanan, GA. I specialize in designing brochures and catalogs, creating informational web sites and digital photography. I would greatly appreciate the opportunity to discuss the designing of any marketing materials and photography that you may need. 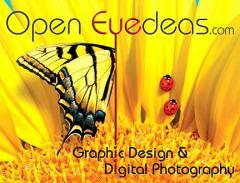 You may visit my web site at www.openeyedeas.com to view examples of my work and additional information. If I can be of any assistance, please contact me.